The Gospel is the Good News that Jesus is the only begotten Son of God who died for our sins and was raised back to life to never die again. OUR MISSION is to serve as a local fellowship of Christian faith which effectively celebrates, lives, shares, and explains the Gospel. We recognize that the Church – both local and universal – has at least two roles in the world: a) prophetic;and b) redemptive. In its prophetic role, the Church, like the ancient prophets of the Old Testament times, may warn the larger culture of the consequences of not living before God and treating each other as we ought, as well as our ultimate accountability to God. It reminds the world of its brokenness, its mortality, its need to be right with God and to respect each other. In its redemptive role, the Church is to live and offer biblically-derived wisdom and values for living, along with a transforming and inspiring message of hope, justice, purpose, mercy and grace that flows from the Good News that Jesus died for us all and was raised back to life to never die again. It is the biblically-based wisdom, values, and message of the Church that can bring renewal and revival to both individuals and societies as a whole. In other words, to use a metaphor employed by Jesus in his Sermon on Mount, the Church is to serve as Salt & Light. As salt, the Church seasons a society with those redemptive attributes of hope, justice, purpose, wisdom, mercy and grace. 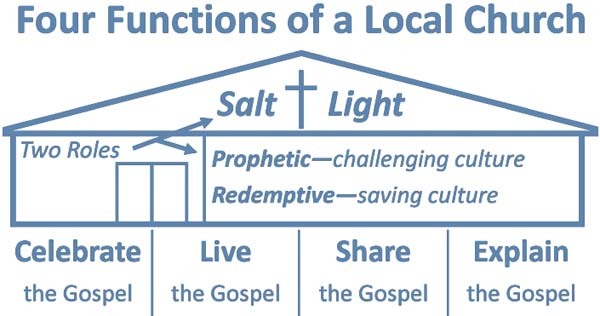 As salt, the Church can act as a preservative, helping a civilization to function and further develop in a just and lawful manner for the greater good and advancement. As our mission statement conveys, our objective is to effectively function as a local church which celebrates, lives, shares and explains the Good News that Jesus died for our sins and was then raised back to life to never die again.